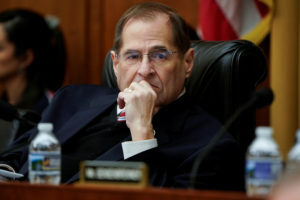 House Judiciary Committee Chairman Jerrold Nadler says an April 2 deadline still stands after Attorney General William Barr said he would deliver a redacted version of special counsel Robert Mueller’s Russia report by mid-April. Nadler also says Democrats want to see the full report, not a redacted version. Barr said in his letter that he would be available to talk to the House panel on May 2 and the Senate a day earlier. Nadler says he will take that date “under advisement,” but would like Barr to come sooner.